Quotes and other lovely things..
Six enticing Quick Reads titles from well-loved authors will be released by The Reading Agency on 1 February 2018. 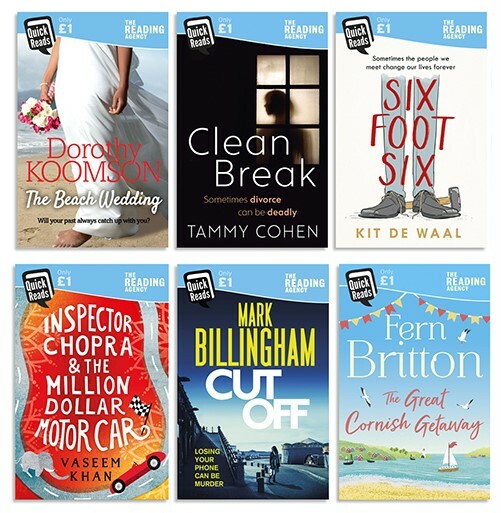 The selection of titles written by bestselling writers Fern Britton, Dorothy Koomson, Mark Billingham, Kit de Waal, Tammy Cohen and Vaseem Khan span the globe from Mumbai to Ghana, from Cornwall to inner cities and explore a wide range of themes including friendship, secrets and lies, marriage and the horror that losing your phone can bring. 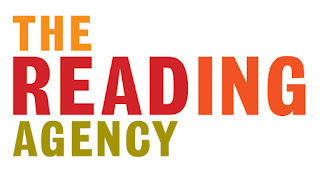 Quick Reads was founded by Baroness Gail Rebuck DBE in 2006 to provide shorter, easier to read, accessible fiction for less confident adult readers. Now in its 12th year, the programme has distributed over 4.8 million books since it was launched and introduced hundreds of thousands of new readers each year to the joys and benefits of reading. Cut Off by Mark Billingham (Little, Brown): A punchy, taut urban thriller about that moment we all fear: losing our phone! For Louise, losing hers in a local café takes a sinister turn. Billingham has sold five million copies of his novels and has twice won the Theakston’s Old Peculiar Award for Crime Novel of the Year. The Great Cornish Getaway by Fern Britton (HarperCollins): As the sun sits high in the sky over Cornwall, and the sea breeze brings a welcome relief to the residents of the seaside village of Trevay, a stranger arrives in need of a safe haven. The former presenter of This Morning, Britton is now a Sunday Times bestselling author and this story is full of her usual warmth and wit. Clean Break by Tammy Cohen (Transworld): A dark and twisty portrait of a marriage coming to its bitter end, from the mistress of domestic noir. Can Kate rid herself of her jealous husband before it's too late? Cohen’s acclaimed novels include The Mistress’s Revenge, The War of the Wives and Someone Else’s Wedding. Inspector Chopra and the Million-Dollar Motor Car by Vaseem Khan (Hodder & Stoughton): An enchanting Baby Ganesh Agency novella from the bestselling Khan set in the bustling back-streets of Mumbai. Inspector Chopra and his elephant sidekick have two days to solve the mystery of a missing – and very costly – car for its gangster owner, or there’ll be a heavy price to pay. The Beach Wedding by Dorothy Koomson (Arrow): A gripping short read featuring a wedding, family drama, and old secrets. Tessa is thrilled when her daughter arrives in Ghana to get married but memories of the last time she was there haunt her; can she lay the ghosts of the past to rest or will they come back to haunt her daughter’s future? Koomson is the bestselling author of 12 novels including The Ice-Cream Girls, My Best Friends’ Girl and most recently The Friend. Six Foot Six by Kit de Waal (Viking): A charming novella from Costa First Novel Award shortlisted author de Waal about finding friendship in the most unlikely of places. Everything changes for Timothy, a 21 year old with learning difficulties, when local builder Charlie calls on him for help. De Waal worked in criminal and family law and was a magistrate for many years before her international bestseller, My Name is Leon was published. "I had one, much older sister as I was growing up so no siblings to play with. Finding books was my greatest joy. Fairy stories with lovely colourful drawings, Enid Blyton adventures and then The Chronicles of Narnia really shaped my imagination. The Quick Reads initiative is enormously important and offers great stories for anyone." "I firmly believe that reading is the foundation for learning. Growing up as someone from a less economically advantaged background reading was both my escape and my inspiration. Today I am a writer because of reading. But reading doesn't come naturally for everyone. Quick Reads’ great insight is to realise that even those who find reading a challenge hanker for exciting, well-written stories that are simple to read. I am delighted that Quick Reads has given me the opportunity to inspire others by providing at least one such story." Mark Billingham has twice won the Theakston's Old Peculier Award for Crime Novel of the Year, and has also won the Sherlock Award for the Best Detective created by a British writer. All of his novels featuring Detective Inspector Tom Thorne have been Sunday Times bestsellers. Sleepyhead and Scaredy Cat were made into a hit TV series on Sky 1 starring David Morrissey as Thorne. A new series based on the novels In The Dark and Time Of Death was broadcast on BBC 1 in 2017. Mark lives in north London with his wife and two children. Fern Britton is the highly acclaimed author of five Sunday Times bestselling novels. Her books are cherished for their warmth, wit and wisdom, and have won legions of loyal readers. A hugely popular household name through iconic shows such as This Morning, Fern is also a much sought-after presenter. Fern is deeply committed to a number of charities, in particular the Genesis Research Trust. She lives with her husband, Phil Vickery, and her four children in Buckinghamshire and Cornwall. Someone Else's Wedding. Her break-out psychological suspense thriller was The Broken, followed by Dying for Christmas, First One Missing and When She Was Bad. She lives in North London with her partner and three (nearly) grown children, plus one badly behaved dog. Vaseem Khan first saw an elephant lumbering down the middle of the road in 1997 when he arrived in India to work as a management consultant. It was the most unusual thing he had ever seen and inspired his series of crime novels. He returned to the UK in 2006 and now works at University College London for the Department of Security and Crime Science. Every day that he is there he is astonished by the way modern science is being used to tackle crime. Elephants are third on his list of passions. Great literature and cricket come first and second, not always in that order. Dorothy Koomson grew up in South London and is the author of 12 bestselling novels including The Chocolate Run, Marshmallows for Breakfast, The Woman He Loved Before and The Friend. Her third novel, My Best Friend's Girl, was selected for the Richard & Judy Book Club and sold over half a million copies. Her novels, The Ice Cream Girls and The Rose Petal Beach were both shortlisted for the British Book Awards in 2010 and 2013 and a TV adaptation loosely based on The Ice Cream Girls was first shown on ITV1 in 2013. Dorothy lives in Brighton where many of her novels are set. Kit de Waal was born in Birmingham to an Irish mother, who was a foster carer, and a Caribbean father. She worked for fifteen years in criminal and family law, was a magistrate for several years and sits on adoption panels. Her first novel, My Name is Leon, is an international bestseller. It was on the shortlists for the Costa First Novel Award and the Kerry Group Irish Novel of the Year Award and was longlisted for the Desmond Elliott Prize. Thanks for taking the time to comment - Jaffa and I appreciate your interest. This website is hosted by Blogger.com and all data collection and cookie usage is overseen by its parent company Google. Jaffareadstoo belongs to Jo Barton © 2011 - 2019. All Rights Reserved.. Awesome Inc. theme. Theme images by nicodemos. Powered by Blogger.